Excess weight is a problem which people all over the world struggle with. In the modern world of fast foods and processed carbohydrates, it can be very hard to maintain a healthy weight, especially if you aren’t an especially active person. Even if you have managed to lose most of your excess weight, you may find it extremely difficult to lose those last few kilograms of belly fat. Also known as ‘love handles’, this fat tends to be extremely stubborn, and often needs a specially tailored workout with a range of different activities to try and move it. CrossFit is a great way to get rid of your love handles for good. Although CrossFit may seem a bit hard or complicated to begin with, it really isn’t that bad. Crossfit workouts are generally made up of a wide range of different exercises. Some of these exercises are extremely simple, while others are extremely complex. The main principle behind CrossFit is that it works the entire body, rather than focusing on a particular set of muscles (like the arms, chest, or legs). Below are ten of the most common CrossFit exercises which you are likely to find in a beginner’s workout. These are all relatively simple, need little equipment, and work a number of muscle groups. Squats are the pinnacle of bodyweight leg exercises. They work almost every single muscle group in your lower body, especially if you start varying your technique and changing things up a bit. Squats are also very easy and can be completed without the need for any equipment. This makes them very popular amongst people who enjoy exercising at home or who can’t afford expensive gym memberships. Burpees are one of the hardest movements on the planet – but they are also one of the best for your health. If you don’t know what a burpee is then a quick YouTube search will reveal that they are the exercise from hell. However, as bad as they may be, they are an extremely good way to get that stubborn belly fat moving. They get your cardiovascular system working extremely hard, and they will have you sweating and puffing after just a minute or two. If you have never had the privilege of doing a burpee then give them a try today! 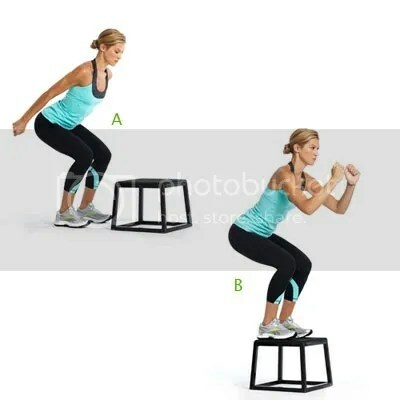 Box jumps are great for your legs, and especially for developing muscular endurance within your leg muscles. They involve jumping from the floor onto the top of a box of specified height, stepping back to the floor again, and repeating the motion for a specified number of repetitions. Deadlifts are a simple type of weight-lifting. They do need some specialized equipment (barbells, weights, etc. ), but most gyms will have what you need. They help develop your power and muscular strength, and can promote a strong core and decent abdominal muscles. Push-ups are an extremely simple exercise which everyone has probably tried at some point in their life. They are great for developing upper body strength, but they can also help to strengthen your core and promote stability throughout the entirety of your body. This can help start the fat burning process, and can help you destroy those pesky love handles! Dips are another upper body exercise which strengthen your chest and back muscles. Again, they promote core stability and help to increase your muscle mass. An increased muscle mass means an increased energy requirement. If you are lucky then your body may start drawing energy from your fat stores – essentially burning up your love handles! Sit-ups are another one of the classic exercises which everyone knows how to do. Crossfit workouts often incorporate some form of sit-up or sit-up variation due to their extreme efficiency in developing core strength and stability and in vaporizing belly fat (and therefore getting rid of love handles)! Lunges are another lower body exercise which are used more to promote flexibility and balance than anything. While they do have some sort of strength component, their main focus is on improving your ability to perform a movement smoothly and in a specified position – something which needs strong core muscles. The Russian twist is something of a more exotic exercise which is a favorite in many crossfit gyms due to its ability to destroy excess body fat (especially love handles) and develop your core muscles. Pull-ups are simple, extremely effective, and easy to do. However, many people simply don’t have the strength to complete a pull-up. Fortunately, many crossfit gyms are equipped with equipment which will allow you to complete the pull-up movement and get the full benefits of it, even if you aren’t strong enough to lift your complete bodyweight off the ground. All or any of the above exercises can be combined into the ultimate crossfit workout to get rid of your love handles – try it!